Ever wonder about that clock face with a counter-clockwise arrow that is shown on the menu bar at the top of your Mac's screen? It's Apple's Time Machine program, the built-in backup software that works with your Mac and an external hard drive (sold separately) or Apple's Time Capsule. Curious about how to use it? It's pretty simple, actually. Connect the hard drive drive, assign it to Time Machine, and start enjoying some peace of mind! Time Machine automatically backs up your entire Mac, including system files, applications, accounts, preferences, music, photos, movies, and documents. 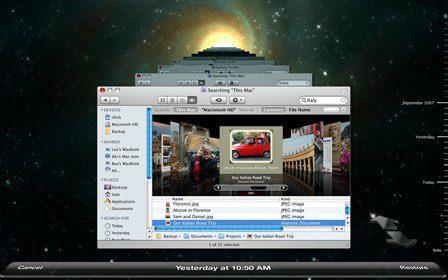 As long as your Mac and hard drive are powered on and connected to one another, the Time Machine software will make hourly, daily, and weekly backups of your data to the external hard drive. What makes Time Machine different from other backup applications is that it not only keeps a spare copy of every file, it remembers how your system looked on any given day—so you can revisit your Mac as it appeared in the past, hence the "Time Machine" name. I'd be glad to assist with any questions you may have about TIme Machine. Have a great technology week!